This project was started following the 2013 OSB kickoff meeting. At that meeting it was decided that the development of individual cell models from the cerebellum would be a good test case for exploring the requirements on technical infrastructure and the social aspects of collaborative model development. Due to the many independent granule cell layer networks being developed by participants at the OSB meeting, the cerebellar granule cell was identified as a good first cell model to focus on. What granule cell models are out there? What electrophysiological properties do labs wish to reproduce in their models? 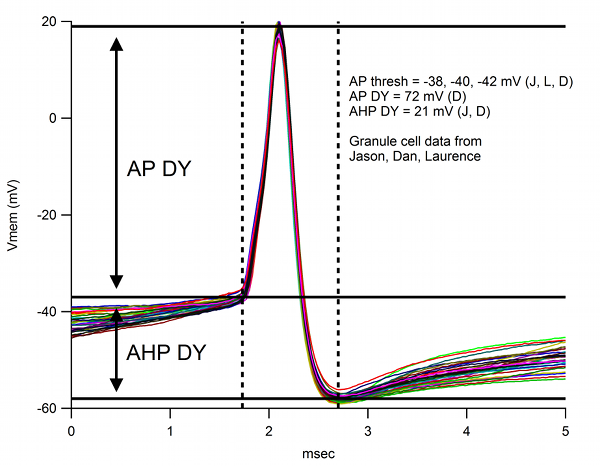 What experimental data is publicly available on the behaviour of the granule cell? How well do existing models reproduce these behaviours? Different species, drugs, experimental conditions will lead to different values for these between labs. Nevertheless, it would be good to get input from as many labs as possible. These figures are mainly based on data obtained by Jason Rothman for the paper: Synaptic depression enables neuronal gain control Nature 2009. Much of this will be based on NeuroUnit/SciUnit and existing test scripts in neuroConstruct projects (e.g. here). What kinds of tests would constitute a good start, e.g. “Properties X, Y, and Z from dataset A should be matched to within 0.5 SD of their mean”? The following is a list of the cell and network models from the basal ganglia which are available in the OSB. Also known as Medium Spiny Neuron. For an introduction to the hippocampus see the article here on Scholarpedia. The following detailed cell models from the hippocampus are available in the OSB. These projects were be discussed in detail at the 2013 OSB Hackathon. This page will be updated during the 2013 OSB Hackathon. See also the page on [[Priorities]]. Primary Auditory Cortex network is a network model of the thalamorecipient layer (IV) of primary auditory cortex (AI), and consists of 2 populations, pyramidal cells and basket cell interneurons. There is a *dedicated page on modelling L5 cells here. Petilla terminology for nomenclature of features of GABAergic interneurons of the cerebral cortex. Channelpedia For ion channel names. The complete nervous system of C. elegans is being modelled by the OpenWorm Project.